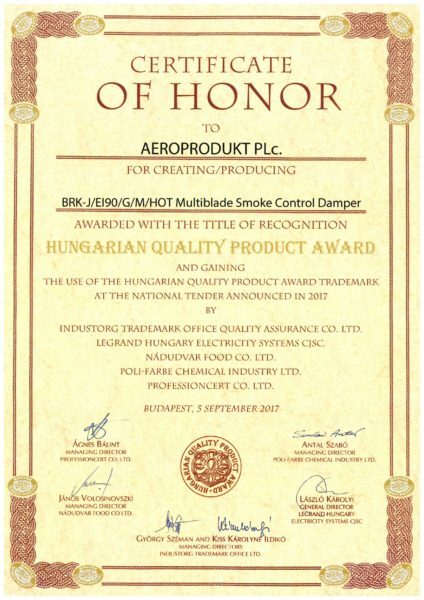 September 5, 2017 in solemn setting in the upper house of the Hungarian Parliament the Hungarian Product Quality Award ceremony was held. This year 64 products and services earned the right to use Hungarian Product Quality Certification Trademark. AEROPRODUKT Zrt. earned the reward with its BRK-J/EI90/G/M/HOT multiplate smoke control damper. Chief Executive Officer of AEROPRODUKT Plc. Zsolt Pusztai received the unique trophy and certificate of honor. The BRK-J/EI90/G/M/HOT multiplate smoke control damper is the largest development of our company in recent years. As a result we introduced the first certified smoke control damper in Europe with a nominal size of 1500×1500. The BRK-J/EI90/G/M/HOT multiplate smoke control damper is made exclusively in Csongrád. The damper has an outstanding fire resistance and a size line unique in Europe. The depth of installation of the awarded product is only 200 mm which allows installation in tight places. The BRK-J/EI90/G/M/HOT multiplate smoke control damper according to the HOT 400/30 (Hot Operational Temperature) certificate in the case of fire, under 400 ° C operating temperature will remain functional for 30 minutes. The quality of the awarded product guaranteed by systematic checks and regular reviews by the Czech PAVUS Qualification Institute. In its 20 years existence the Hungarian Product Quality Award became the most esteemed certification system in Hungary. Awarded to products and services created with unique solutions and innovative ideas and outstanding quality. These principles are the core of our corporate approach and reflected on our day-to-day operations. Earning the Hungarian Product Quality Award is a great honor, recognition but foremost commitment. According to this we will continue to pay close attention to the quality in the future.